O-Solv contains a blend of citrus based oils and petroleum distillates which help remove tar, grease and ink. O-Solv can be used on carpet, ceramic tile, grout and upholstery. O-Solv's 100% active formula provides great economics. 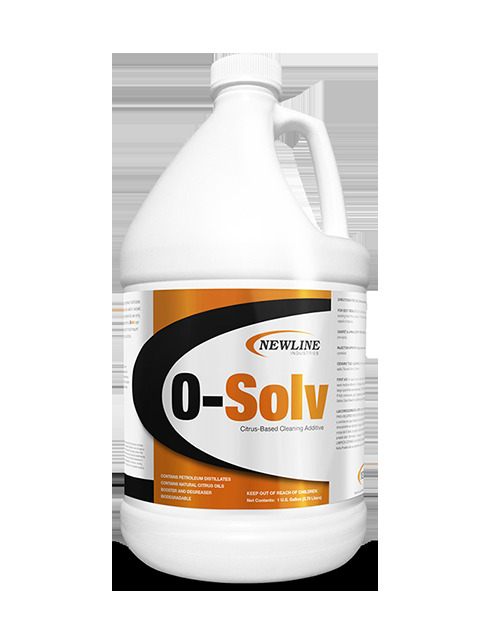 O-Solv can also be used to remove adhesives. Its safe for pumps in truck mounted equipment when diluted properly according to instructions. For general use: Pour O-Solv on a clean rag and use the damp rag to cautiously blot old gum, oil and grease spots. Work from the outside in. Extract and rinse. DO NOT pour directly onto carpet or fabrics. For carpet/upholstery pre-spray: Dilute 1 - 2 oz. per gallon. For high pressure injection sprayers: Dilute 4 - 6 oz. per 5 quarts. Meter at 1:8. For ceramic tile cleaning: Dilute 2 - 4 oz. per gallon of RTU Hi-Test solution. Follow Hi-Test directions for cleaning.